No set is collected in the hobby as much as plain Topps Baseball. Strip away the inserts, variations and other extras and you've got a fairly simple set to build. Almost. Several modern Topps baseball card sets are missing #7. It's not an oversight. It's not a gimmick to make you buy more packs. It's not intended to drive you nuts (even if it means an empty spot in your binder). So what's with the missing #7? 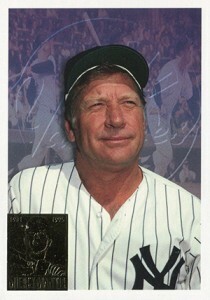 It's intended to be a tribute to Mickey Mantle, one of the hobby's giants and an important figure in Topps' history. When Mickey Mantle passed away in August, 1995, Topps decided to do something special for the iconic Yankees great. It started with a tribute card in 1996 Topps Baseball. Appropriately, it was card 7. From that point on, that spot on the flagship checklist is reserved for Mickey Mantle and nobody else. It's the hobby equivalent of a retired number. It also only applies to the flagship Topps Baseball set. Other releases like Topps Finest and Allen & Ginter don't have the missing card. The reasoning wasn't so much about Mantle's play on the field as it was his popularity and how that transferred into baseball card sales. When it comes to the hobby's modern history, Mickey Mantle is its poster child, at least for the 1950s through the 1980s. Starting with 1997 Topps Baseball, there was no seventh card in the main set. It remained this way for a decade. Topps reached a deal with Mantle's estate to use his image in their products again. That meant taking card 7 out of retirement. However, it still belonged to the Hall of Famer. 2006 Topps Baseball also included an insert set called Mantle Collection. This created cards with designs from the "lost years" of 1997 to 2005. There was also a 1996-style card due to the fact the tribute card didn't go with the set's regular design. All was good in the world of set builders in 2006 through 2012. With Mantle back in the Topps fold, there were no "missing" cards, no empty slots in pages. The deal between Topps and the Mantle estate expired before 2013 Topps Series 1 Baseball was released. With no deal in place, #7 went back into retirement. So if you're building the Topps set and all you think you need is card 7, you're good. It's supposed to be that way. Card #7 is also missing from the 2014 Topps Coca-Cola Giants team set that was a Stadium Giveaway.